Easter is Sunday March 31. Call to order (888) 884-1555. A tisket, a tasket, send our delightful carnival of an Easter basket, filled with a jumble of brightly colored spring flowers, and brighten someone’s day! Perfect for the holiday, or just to send a smile. 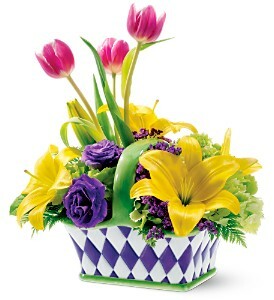 Pink tulips, yellow Asiatic Lilies, green hydrangea, purple lisianthus and sinuata statice are accented with leatherleaf fern and lemon leaf, and delivered in Teleflora’s Spring Carnival basket.